Chalk one more up to the Vulcan Bug/Upgrade pile. I recently requested an upgrade to the Open Pit > Open Cut Design > Pit Topography tool. 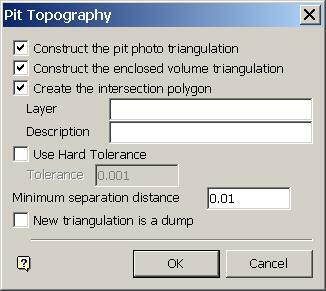 Basically, what the tool does is an automated boolean of two triangulated surfaces: a pit design and an existing topography. The result can give one or all of three things: a new surface topography, a mined solid or an intersection of the two surfaces. In my case I want only the resulting intersection. The Vulcan tool allows the user to specify a new or existing layer for the resulting string as well as a description. I use this intersection polygon later in the creation of Progress Maps in Vulcan. In order to produce period by period maps of the mine schedule the intersection polygons of each pushback must have the same object name. 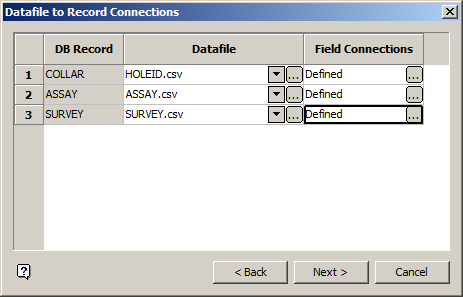 This object name must be different from the object names of the remainder of the data on the screen so using 'blank' as an object name won't work. The simple fix for this would be to add a checkbox and field to the panel for the Open Pit > Open Cut Design > Pit Topography option. This would allow the user to select if they want to assign an object name and specify the name. It isn't hard to assign object names later but it is a separate step. One that I invariably forget for at least one pushback in my mine design. I talked to my friends at Maptek and they logged this upgrade as JIRA number VUL-10292. We'll see if this has the importance to make it into a release any time soon.